Several methodologies nowadays coexist in order to couple concentration data and air mass history. The majority of these are enabled in ZeFir; Potential Source Contribution Function (PSCF), Concentration-Weighted Trajectory (CWT), Concentration Field (CF), Multi-site Merging, and Cluster analysis. 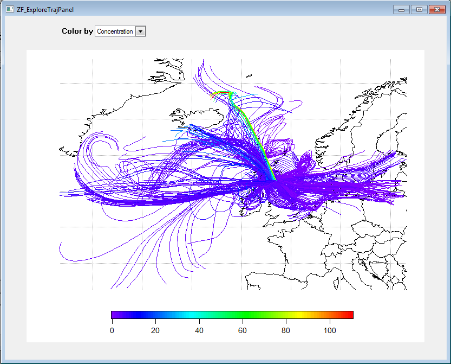 Below is the panel dedicated to trajectory analysis in ZeFir. Example: Bardarbunga eruption in september 2014. 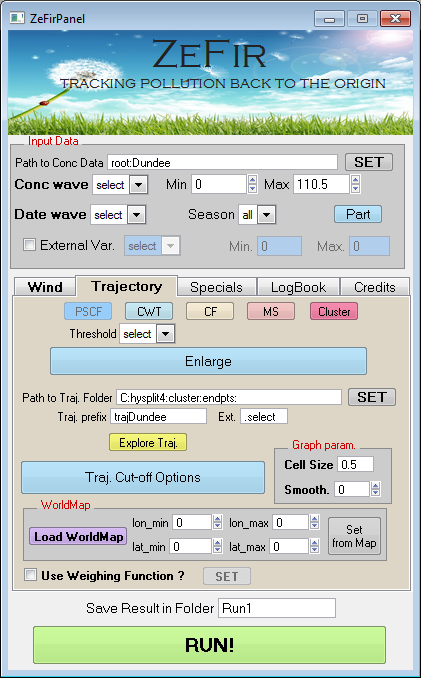 SO2 data in Dundee, Scotland, were retrieved from the Scottish air quality network. - Simple plot: trajectories can be easily loaded and plotted. Here, they are colour-coded following SO2 concentrations. - Concentration-Weighted Trajectory: see background on trajectory analyses for more information about this approach. - Cluster analysis: trajectories are averaged into clusters. the 3 graphs are automatically displayed after calculations.